Edgecroft is a 1,675sqm / 18,500sqft new build, six bed / six bath home, offering a highly efficient ultra-modern and contemporary specification, delicately designed to fit well within the Cheshire countryside. This luxury home is located along Macclesfield Road, Alderley Edge, which is within the Alderley Edge Conservation Area. Its locality is a highly sought after area of predominantly substantial detached properties, set within mature gardens in deep plots with hedges bounding each site. It has greenbelt to its southern boundary. 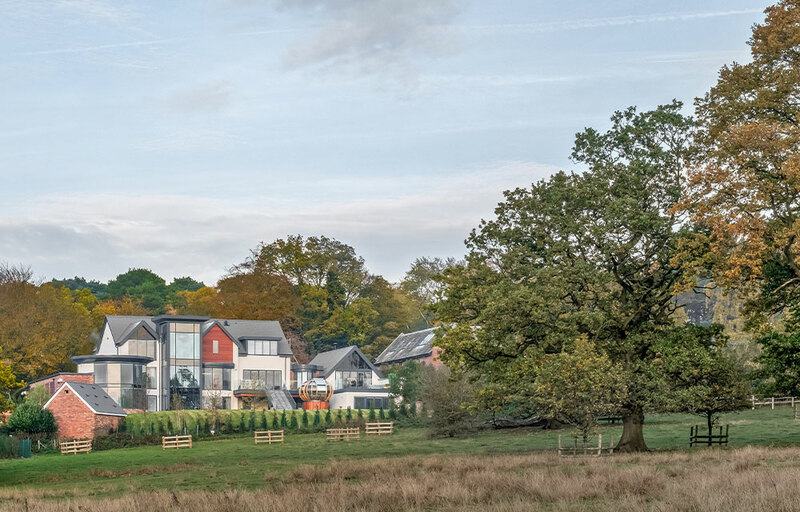 Years of experience as architects in Alderley Edge designing and obtaining Planning Permission for luxury homes, positioned us well to create an expansive contemporary home with spectacular views of the surrounding countryside. As a practice specialising in architecture in Cheshire greenbelt, we brought all of our creativity and experience to successfully obtain Planning Permission for this stunning super home. Employing an upside down concept, the Client’s brief was developed to offer reception spaces and living accommodation at first floor, to maximise visual amenity and offer undisturbed views across the Cheshire Plains. 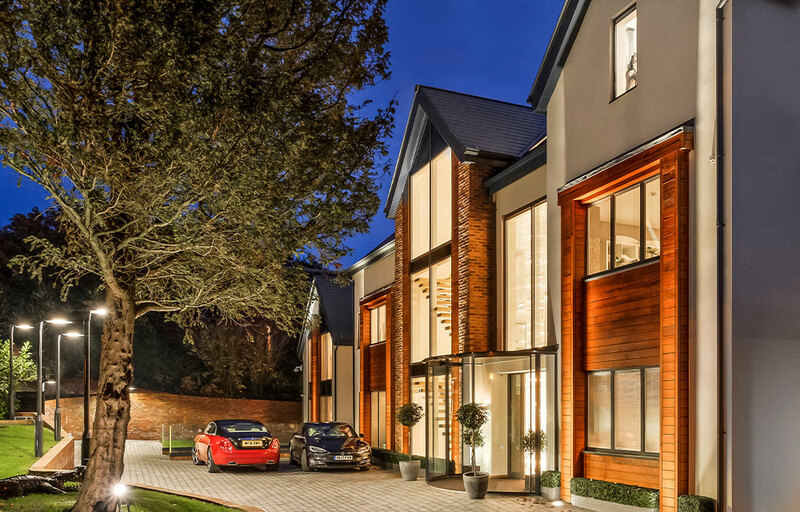 The bedrooms are located on the ground floor and an undercroft garage accessed via an exquisitely designed front drive, offers eight car parking spaces. The undercroft garage is connected to upper floors with a scenic glass lift, that rises at the rear of the property, maximising views across the greenbelt. The leisure wing is accessible from both the ground and first floor areas and offers a 10m pool with sauna and changing facilities. The leisure wing is completed by a structural glazed ‘box’ gym.